DVD is not as popular as old days. Even if you have some DVDs, you may prefer to rip DVD and save the DVD videos to computer, thus you don't need to bring fragile bulky DVDs with you. Obviously, it is only one of many reasons for saving DVD to computer. Other reasons include: save DVD to computer for burning a new DVD later, flexible playback on computer or mobile devices, back up precious movie collections, free up some room in your house, and so on. Whatever the reason, this article will deliver the best two solutions to save DVD to computer. No matter who you are, a freeware seeker or a specialist software follower, a home-made DVD owner or a copy-protected DVD holder, a beginner or a tech geek, you will get a satisfactory answer here. How to Save DVD to Windows/Mac Computer? Download WinX DVD Ripper Platinum to rip and save home-made and commercial encrypted DVD videos movies in MP4, AVI, WMV, MOV, FLV, DivX, etc to Windows/Mac computer. How to Rip and Save a HOMEMADE DVD to Computer with HandBake for Free? If you just want to save a home-made DVD without any copy protection schemes to computer, you can get help from some free DVD converters like HandBrake. HandBrake is an open source video transcoder capable of ripping unprotected DVDs to MP4 and MKV for saving and playing on computer and other devices. Moreover, it also comes with presets for iPhone, iPad, iPod, Apple TV, Android and Windows Phone. And it is also worth mentioning that HandBrake is a cross-platform program available for Windows, Mac and Linux. Simply go to HandBrake official website, download the edition compatible with your computer OS, install and launch it to save DVD to computer for free. And here we have prepared a step-by-step guide to rip and save home-made DVD to computer with HandBrake, in case you can't handle it on your own. Step 1. Insert the DVD you want to save on your computer, then click "Source" button on HandBrake and tap your DVD drive. 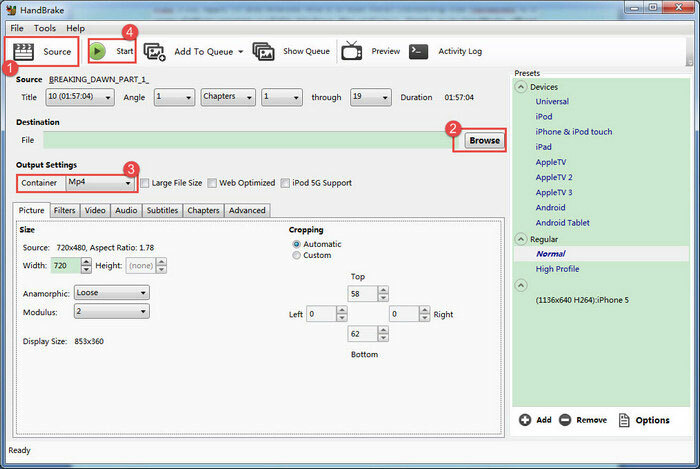 Then, HandBrake will begin scanning the DVD titles immediately and select the main title for you spontaneously. Step 2. Click "Browse" to choose which computer folder you want to save the ripped DVD video to. Step 3. Specify output format and modify settings. In general, you just need to select the "Container" (MP4 or MKV). If you have special needs, you can set video audio parameters, adjust resolution, etc. Step 4. Hit the green "Start" button located beside "Source" button to begin copying and saving DVD to your computer hard drive. If you encounter some problems while using HandBrake for DVD saving on computer, check if the following solutions can help you out. How to Save COPY-PROTECTED DVD to Computer with WinX DVD Ripper? Apart from open source DVD rippers like HandBrake, there are many top-notch commercial DVD rippers in the market, among which WinX DVD Ripper Platinum is the most popular one for Windows and Mac, including Windows 7, 8, 10, Vista, macOS Mojave and lower. 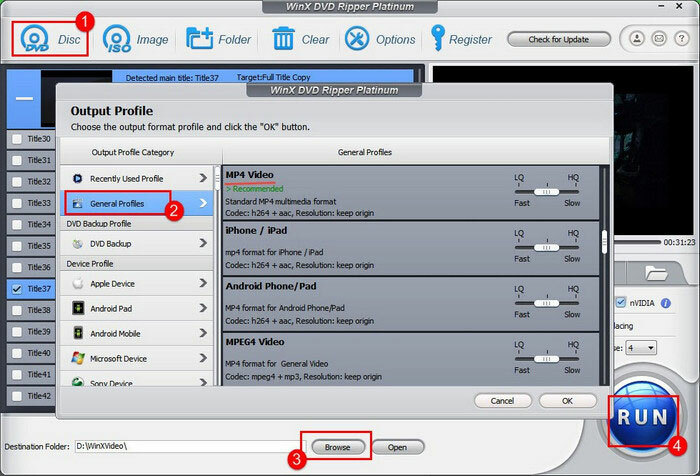 Not only support for saving home-made DVD to computer, it is also skilled at ripping and saving any copy-protected DVD in AVI, WMV, MP4, MPEG, H.264, MOV, FLV, MKV (only available on Mac version), 3GP, and other mainstream formats on PC and Mac. Meanwhile, it also enables users to copy and save DVD as ISO image file and DVD folder to computer. Other highlights include: 320+ output formats, 350+ preloaded profiles, fast DVD ripping speed owing to advanced technologies, superb video audio quality, rich video audio parameter settings, etc. Have some DVDs locked by DVD CSS, region code, RCE, Sony ArccOS, UOPs, Disney X-project DRM, or other schemes? Follow the guide below to remove the DVD copy protections and save DVD videos on PC/Mac computer. To begin with, download, install and launch this DVD converter on your computer. Step 1. Insert target DVD to DVD-ROM and click "DVD Disc" button located at the top left of WinX DVD Ripper Platinum to load the DVD. Step 2. Choose an output profile. Only a few seconds later, this tool can load the DVD, detect the main title and meanwhile pop up the output profile window for you to choose which format you want to save as on computer. Step 3. Hit "Browse" to define which destination folder you want to save the DVD video to. Step 4. Click "RUN" to begin ripping and saving copy-protected DVD movie to computer right now. HandBrake could be an option for saving unencrypted DVD to computer if you don't mind the limited output formats/presets and unexpected errors. But if you want to have an easy-to-follow yet feature-rich DVD ripper for both home-made and commercially copy-protected DVDs, WinX DVD Ripper Platinum can be the best way out. How can I rip a DVD to computer? Here's a guide leading you to copy and convert unprotected or copy-protected DVDs to Windows (10) or Mac computer quickly and easily. This is a guide on how to rip and copy Disney protected DVD for family movie backup, not only removing Disney x-project DRM copy protection, but also dealing with (new)Disney DVD with 99 titles freely and easily. Part 1How to Rip and Save a HOMEMADE DVD to Computer with HandBake Free? Part 2How to Save COPY-PROTECTED DVD to Computer with WinX DVD Ripper?